The world's first tissue-engineered urinary tubes or urethras, grown in the lab using patients' own cells, have been hailed a success by medical experts. 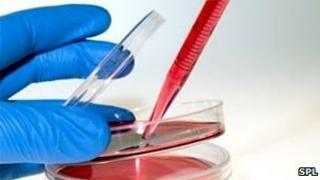 US surgeons have used the lab-grown tubes to treat five Mexican boys with damaged urinary tracts. They told the Lancet that all of the boys are now fit and that the grafts have taken and repaired the defects. The same team has already managed to grow new bladders for patients. Professor Anthony Atala and colleagues are currently working to engineer more than 30 different replacement tissues and organs. He is director of the Wake Forest Institute for Regenerative Medicine in Winston-Salem, North Carolina. The first step in engineering the replacement urethras was taking a small sample of cells from the bladder of each of the boys. Aged 10 to 14, the boys had suffered injuries in accidents. From these samples, the scientists isolated the cells they would need to grow the new structure that expels urine from the bladder. These cells, needed to make the muscle, lining and supportive tissue, were nurtured and multiplied in the lab for weeks until they were plentiful enough for the job. They were then placed onto a biodegradable mesh that was shaped into a tube and sized to be a perfect fit for the patient. Six years on the grafts are still doing well, looking and functioning exactly like a normal urethra in the five boys who are now entering their teens. Without this revolutionary treatment they boys would have required an artificial graft that has up to a 50% chance of failure, or would have faced a life of probably incontinence and repeated urine infections. Professor Chris Mason, an expert on regenerative medicine at University College London, said: "Totally grown in the laboratory, these urethras, living tubes which convey urine from the bladder, highlight the power of cell-based therapies. "Using living cells as 'medicines' is a major step-change in clinical practice. Cell-based therapies complement drugs and devices by aiming to cure the large unmet medical needs of our generation, including blindness, diabetes, heart failure, Parkinson's disease and stroke."